Born: Nov 9, 1934 in Brooklyn, New York, U.S.
Died: Dec 20, 1996 (at age 62) in Seattle, Washington, U.S.
Carl Sagan, an astronomer, cosmologist, and astrophysicist, was born in Brooklyn, New York, in on November 9, 1934. He spent most of his career as a professor at Cornell University where he also directed other studies. During his time, he made over 600 scientific publications and he also wrote and edited more than 20 scientific books. In addition, he advocated scientific skeptical inquiries and methods, promoted and pioneered exobiology, and promoted the SETI (Search for Extra Terrestrial Intelligence). 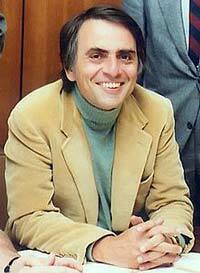 Sagan graduated from the University of Chicago where he studied extraterrestrial intelligence and planets. Before then, he graduated from Rahway High School in New Jersey in 1951. Carl was raised with his sister, Carol, in Brooklyn’s Bensonhurst neighborhood and his father, Samuel Sagan, was a Russian immigrant worker in the United States. Even at a young age, Sagan was so eager to become a scientist. This idea was driven by a science book he read about how the sun was close to the earth. Carl Sagan was an astronomer who excelled at explaining the most complicated ideas in a simplified manner that was easy to understand. He was once described by Isaac Asimov as one of the only two people he had ever met with higher intelligence than his. While attending the Chicago University, Sagan participated in the Ryerson Astronomical Society in 1954 and received a bachelor of arts in “nothing,” as he described it. In 1955, he received a bachelor of science in physics and in 1956, he obtained a master’s in physics before earning his astronomy and astrophysics Ph.D. in 1960. Besides his popularity in science books and the award winning Cosmos TV series, Carl made tremendous contributions to the field of astronomy. In the 1950s, he helped design mechanical devices that were used on space flights. He also published two crucial theories that were confirmed by space flights. One of Sagan’s theories was that the planet Venus was very hot. The other one stated that Mars did not have a season where plants could be grown, contrary to what other scientists had believed at the time. He explained that the dark areas of Mars that were thought to be plants were simply gigantic dust storms in the Martian atmosphere. Sagan was also involved in efforts of the Americans trying to explore the other planets in the solar system. He was one of the members of the Mariner-Nine to Mars voyage, which was the first vehicle to orbit a different planet. He also helped in choosing the landing area for Viking One and Two, which were the first two vehicles to land on Mars. In addition to these, he worked on Pioneer Two, which was the first space vehicle that was to investigate Jupiter, and the Pioneer 11 which flew past Saturn and Jupiter. Before his death on December 20, 1996, Carl Sagan served as the Duncan David Professor of Astronomy and Space Sciences as well as the Director of Laboratory for Planetary Science Studies at the University of Cornell. He died of pneumonia in Seattle, Washington.